We've teamed up with The Crown at Stoke by Nayland to offer an exclusive 'explorers package' to help guests get out and explore the extraordinary surrounding countryside with it's quiet lanes, pretty villages and traditional 'Market Towns' . Come and explore the countryside that inspired artists including Constable, Gainsborough and Turner to name a few! Each guest booked into The Crown with the 'Two Night Explorer Package' is automatically assigned 4 'Explorer Credits' redeemable against equipment hire as described below. Each 'Explorer Credit' is worth the equivalent of a 'half day hire'. Min 2 people ie 8 'Explorer Credits' across two days to share. Standard Plus (Hybrid) Bikes come with rider helmets, lock , repair kit and appropriate route mapping. You are of course free to ride any route you like, we have a stock of OS maps to borrow or buy from which you can design a route. Constables Country Highlights: 0.5 and 1 day route options taking in the best of Constables Country incl Dedham and Flatford Mill. Country Houses and Open Gardens: 1 day route showcasing some of the most exceptional historic house and gardens in the area. Vines & Farms: 0.5 and 1 day route options taking in the best of local food, wine and textiles production from award winning wines to the finest Alpaca wools! Villages and Lanes: 0.5 and 1 day route options meandering through some of the quietest lanes to reveal the most scenic views and prettiest brooks. Explore the tranquil, and calm, River Stour with one of our traditional 'Canadian Canoes' or a 'Sit-on-Top Kayak. 0.5 Day 'return' paddles from our Hire Centre in Sudbury. 1 Day 'one way' paddles starting at our Hire Centre in Sudbury, finishing just 2 miles down the road from the hotel at The Anchor in Nayland. 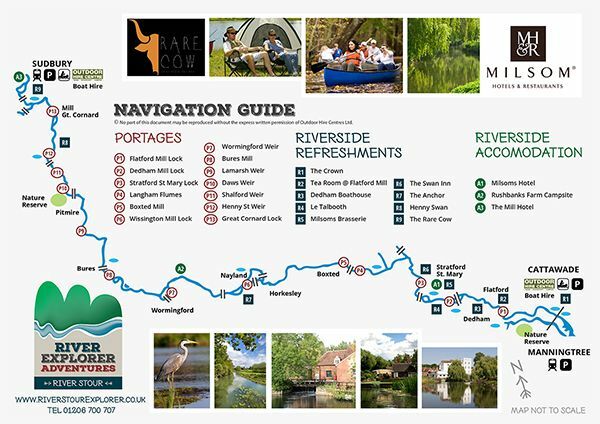 For a taster of what the river has to offer, please download our 'Navigation Guide' by clicking here. Taxi Transfers can be arranged, please pay the taxi directly.